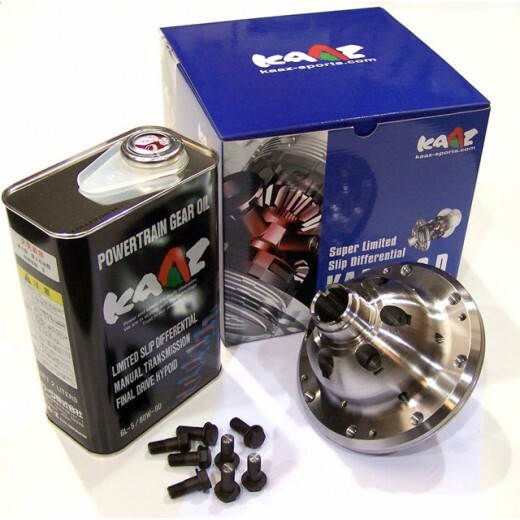 This KAAZ LSD for the Ford Fiesta provides a dramatic control upgrade and delivers a commanding, consistent performance. A 1.5-way limited-slip differential is the most common LSD upgrade option in performance and race cars. It is referred to as a 1.5-way because it functions under acceleration and to a lesser extent under deceleration. It provides differential locking characteristics under acceleration, maximizing power distribution to the wheels that need it most. Under deceleration, the 1.5-way LSD engages to assist in braking stability and smoother turn-in. WHY CHOOSE A KAAZ LSD? Many assume that limited slip differentials from different manufacturers are all the same, however, KAAZ use a clutch type differential, which is beneficial to road racing due to liner/faster lockup with more predictability. On Torque Biasing units such as Quaife LSDs, when one wheel lifts, there comes a reaction where the differential now carries a open differential character due to power only being transfered to one wheel, however when the lifted wheel makes contact there is a time frame in which progressive build-up is needed in order to transfer full power. This problem can be a huge downfall when used in road or rally racing where the car is more likely to be subject to wheel lift. The KAAZ LSD provides power even during one-wheel-contacts. Kaaz limited-slip differentials solve the problems associated with factory equipment. Kaaz products are built and tuned to deliver higher strength, more traction, and greater stability. The result is quicker lap times and improved handling characteristics with the car under your control in a performance setting.